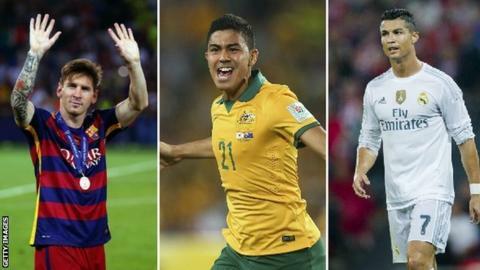 Ballon d'Or: Massimo Luongo joins Messi & Ronaldo on longlist? What do Lionel Messi, Cristiano Ronaldo and Massimo Luongo all seemingly have in common? Incredibly ex-Swindon Town and QPR midfielder Luongo has been named alongside four-time winner Messi and three-time winner Ronaldo on a 59-man longlist, apparently for the Ballon d'Or world footballer of the year award. Ronaldo and Wales' Gareth Bale are two of seven Real Madrid players on the shortlist, according to Mundo Deportivo, while Barcelona also have seven nominees. But Luongo, 23, is QPR's and the Championship's sole representative after signing for the Hoops following their relegation from the Premier League last season. And while Messi won the treble including the Champions League last season, Luongo was plying his trade in League One with Swindon. But he did get his hands on some silverware, winning the Asian Cup with Australia and being named the tournament's most valuable player. Premier League new boys Bournemouth have on-loan Chelsea winger Christian Atsu on the list while Tottenham's Harry Kane gets a nod for his 21 Premier League goals last season, as does his new South Korean team-mate Son Heung-Min. Other notable names include Leicester's new Japan international Shinji Okazaki, Swansea's Andre Ayew and former Cardiff and Inter Milan midfielder Gary Medel. Manchester City have the most players nominated from the Premier League with five while rivals Manchester United have three players on the list including Wayne Rooney. Arsenal have David Ospina among their two nominees while Liverpool's Philippe Coutinho is the sole representative from Merseyside. The long list was to be officially released on 7 October, which would then be cut down to 23 and trimmed once again to a three-man shortlist before the winners' ceremony in January. BBC Sport asked Fifa to confirm or deny the accuracy of the leaked list, but they refused to comment.